On April 11, after much development work and preparation, LDPD and LITO rolled out a major upgrade to the CUL blogs platform. The move from WordPress MU (Multi-User) to WordPress MS (Multisite) was much needed and long anticipated, and will bring a variety of benefits to everyone involved with editing, supporting, and viewing CUL Blogs. WordPress Multisite is more secure, and will allow us to keep up with current releases going forward. We’ll also be integrating CUL blogs with Google Analytics, and we’ll install an improved spam blocker to keep unwanted entries from blog post comments. Provides a familiar but simplified interface and navigation. 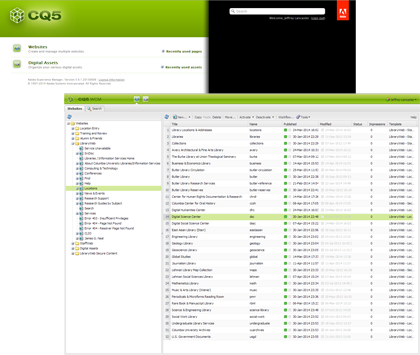 Enables greater control over title and layout options for blog administrators. Offers more appearance customization, such as blog colors and rotating images. Allows us to easily add new functionality with plugins and custom widgets. One important change is that we’ve updated the rich text editor, which should address some known issues with content loss while using the older version. Another welcome addition is the integration of Akismet, which should greatly reduce the amount of spam in blog comments. You’ll find a new spam queue on the Dashboard where flagged messages will wait for your review, and you can configure options for this feature from the Settings menu in the Dashboard sidebar. We encourage you to spend a little time exploring the new interface and features, and we hope you’ll find this update makes working with your blogs a bit easier. 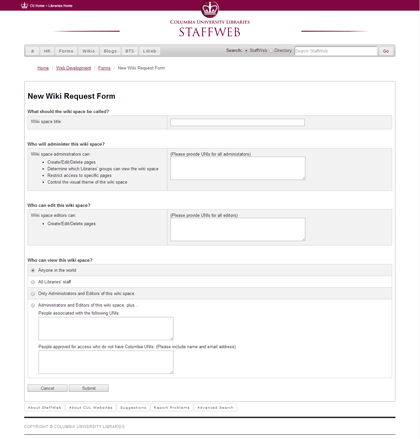 We’ll be updating our blog documentation on StaffWeb soon to reflect all the changes, so that’s always a good place to start if you need assistance. This entry was posted in Blogs (Wordpress), News and Updates on April 18, 2014 by Dmitri. As always, if you need assistance working within an existing CUL wiki space, you can send email to the wiki support alias: wikisupport@library.columbia.edu. This entry was posted in News and Updates, Wikis (Confluence) on April 18, 2014 by Dmitri. Join me in the Studio@Butler for Creating Content and Writing for the Web. The workshops will be held on April 15, 22, and 29 (all Tuesdays) from 2-3:30 p.m. Please RSVP candicekail@columbia.edu. 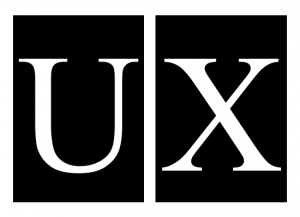 Creating Content and Writing for the Web is a short series of workshops for librarians and other content contributors within the libraries to explore online expression in various forms. Just as literature encompasses various forms – from haiku to the novel to theatrical comedies – so too does online writing and content. From tweets, social media posts, and mobile content to blog articles and expository content, writing for the web involves a mixture of talent, inspiration, craft, and artistry. In much the same way that an informational brochure's content differs from the content of an article, web content changes depending on its function and where it resides. Like other types of content, the way it is crafted and the processes by which it's developed can impact its effectiveness. In this workshop, participants will begin to think more critically about web content, learn techniques suited to the web as a medium in its various forms, and work on developing an approach to their own web content. Join me for three sessions and begin to reshape your online communication approach! This entry was posted in Blog Posts, Creating Content, News and Updates, Training and Workshops on March 27, 2014 by Candice. As you all are hopefully well aware, our almost year-long effort to redesign the Libraries primary public website is approaching its conclusion. The new site will go live in soft-launch on June 3. Hopefully all LibraryWeb content contributors are keeping up with Libraries Website Redesign Blog. There's a lot of critical information there, so we encourage you to subscribe to make sure you're up to date with the latest announcements. After the launch, check back here for more information about changes to the content contributor experience, as well as a preview of what's coming next with CQ, blogs, and other Web CMS updates. This entry was posted in News and Updates, Websites (CQ/AEM) on May 21, 2013 by Dmitri. 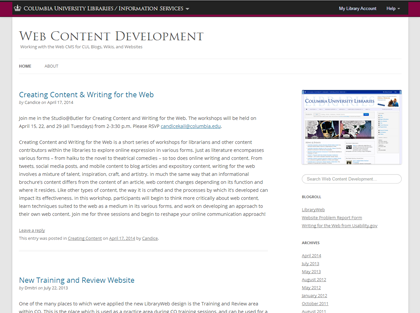 We will soon launch a blog about the LibraryWeb redesign process that is currently under way! Look for it here and via StaffWeb. We will send an email announcement when it's live. 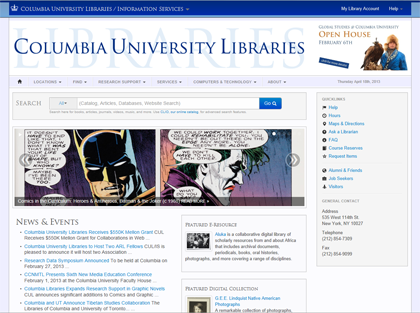 Update 2012-10-15: The LibraryWeb Redesign Blog is now live! This entry was posted in Blogs (Wordpress), News and Updates on August 17, 2012 by Candice.